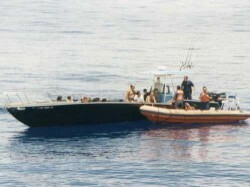 A Cuban fishing vessel was apprehended by Her Majesty’s Bahamian Ship Nassau last Thursday, for illegal foreign fishing, possession of sharks and long line fishing apparatus in Bahamian waters. According to a press release sent out by the Royal Bahamas Defence Force (RBDF) yesterday, HMBS Nassau under the Command of Lieutenant Commander Raymond King was on routine patrol on the Great Bahama Banks when the 50-foot Cuban Vessel was intercepted approximately 87 miles southwest of Ragged Island. Upon further investigation by Nassau’s boarding party, a quantity of scale fish, lobster and sharks were discovered onboard. Six Cuban nationals were subsequently detained and transported to Coral Harbour Base along with their vessel and fisheries products where they were handed over to authorities from the Department of Marine Resources and the Royal Bahamas Police Force for further processing.